Rachel and Company - Happy Thanksgiving! Getting married. Finding a partner who supports my ideas and who is not only on my team but also my number one cheerleader has been monumental in transforming my life. Biting off more than I could chew. Simply put, I said “yes” one too many times. The months where my team and I worked longer than normal hours and were stretched thin were pivotal for me and the business. I was forced to take a step back and reevaluate what was working, what wasn’t, and what should change. Stay tuned in the upcoming months for more on that! Opportunities to collaborate. I’m often asked about the products that I use and recommend and it has been such an honor to collaborate with companies that create functional and reliable products, including Fridge Coasters, Chatbooks, Savor, and more. Stepping out my comfort zone. As a shy person, speaking in front of an audience is very difficult for me. This year I had the chance to speak with groups about topics that I’m passionate about, including organizing yourself healthy and managing physical and emotional clutter. Even with all of that practice I’m still too nervous to do an Instagram Live, but I’ll take the leap soon enough! Meeting you in-person. I hosted a number of events this year including a small space workshop with West Elm and a travel/style event with Kit and Ace, and it was incredible to experience the live interaction and answer your organizing questions in person. When I’m not on client site I’m usually behind my desk at my home office, so getting the chance to chat at events is always a treat for me! 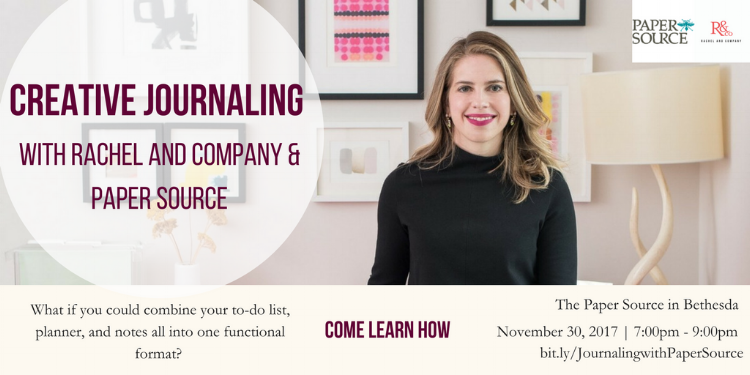 If I haven’t had the chance to meet you yet, join me at the Paper Source Bethesda for my next event on Creative Journaling. Working with my girls. Being able to work with my identical twins on a couple of live TV segments focused on organizing tips for the family was so special for me. Not only were they excited to be in front of the camera, but together we chose the products to feature and wrote the talking points, which gave them a sense of ownership and pride for what was presented. Social media. I know that social media isn’t for everyone, but it has brought me to many of you. I’ve been connected to clients, readers, brands, and found inspiration through like-minded accounts. For me, the experience is what you make of it! What is your favorite holiday tradition or dish? My Thanksgiving meal this year will look a little different than previous years (thanks to Hashimoto’s), but since I’ve been having to make every meal/snack that I consume I’ve mastered a few recipes and will be whipping up a batch of my favorite coconut date macaroons. Fingers crossed it’s a crowd pleaser!